How to Make Money Blogging For Beginners: The Blogging Guide! →How to Make Money Blogging For Beginners – A Blogger’s Must Read! How to Make Money Blogging For Beginners – A Blogger’s Must Read! “How to make money blogging for beginners?” you ask. Excellent question and here’s the short answer. First: Create quality content that ranks in search engines like Google to bring in traffic. Second: Then convert that traffic to cash through affiliate marketing programs, advertising, or sell digital and/or physical products from your blog. And it is… once you know what you’re doing! I turned a simple blog into a passive online income source and you can do the same thing too. Anyone can do it really, but it helps to have proper training and guidance as you begin your blogging career. I’ve seen way too many new bloggers waste time and effort through trial and error, only to never have their content rank. Eventuall they quit their blog and abandon their blogging dreams. Today I’ll show you the exact steps to take to get your blog started and the most efficient way to make money with your blog. The following steps will help maximize your time and financial success as a blogger! 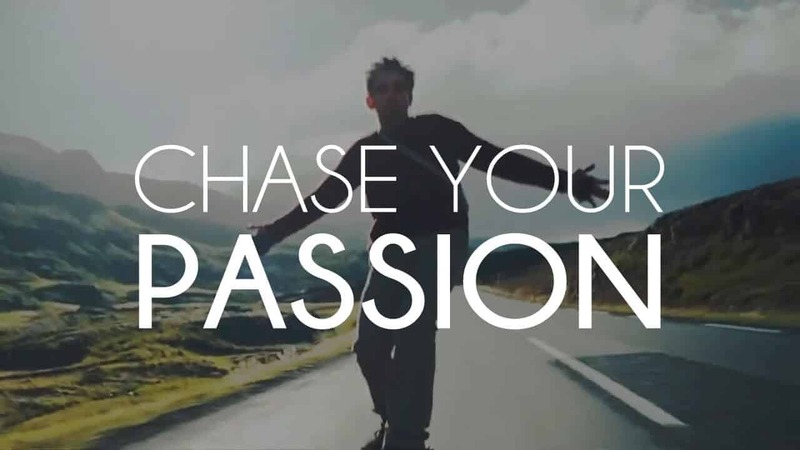 Find Your Passion, Find Your Niche! Sound’s like a bunch of boring steps? It is, there’s a much easier way to get your site up and running. I want you to really take off the emphasis on the money part as you start your blog. Beginning bloggers need to start out with a clear focus before they start creating their blog. You basically need to decide what your blog is going to be about. This is called you niche and it’s important to pick something that’s meaningful to you, and one that has products associated with it that you can sell online. Otherwise it’s tough to make money with your blog. If you’ve got enough traffic, you can make money through advertising, but you’ll make much more money if you have niche related products that you can promote. As you create blog posts, you want to make sure that your posts are targeted with keywords that reach your blog audience. This is how you build warm leads that are already interested in your niche. It’s also how you connect with your blog audience on a more personal level. You do this through keyword research. Which isn’t really that complicated, it’s like predicting what people are googling for – within your niche. You then rank that content, bring in traffic to your blog, then direct that traffic to buy something. Still with me here? Excellent! This could be as simple as directing the reader from one blog post to a product review or a sales page. Eventually you lead that reader to a helpful product through a link (this is affiliate marketing) or you send them to a digital or physical product directly from your blog (this is e-commerce). The easiest way for most bloggers to start earning cash is through adverting. Things like placing banner ads or Google Adsense on your website or within your content. When someone clicks on the ad, you make money. Most advertising that pays you on a pay per click basis don’t pay that much money, so that’s where affiliate marketing and e-commerce come into play. Once you have traffic, you will then add email marketing. This is simply marketing to the reader through emails, typically an automated email series that you’ve already created. Hopefully you then send more helpful content to your new email subscriber and an occasional helpful niche related product (that you make a commission on). You need to really focus on what you’re passionate about. Your passion will ultimately define the theme to your website. Like I said, in the online world we call this theme or passion a niche. What do you want to blog about? A hobby, your profession, your interests, you? Make sure you really take some time to think about it. You will be writing plenty of content in your blog related to your niche, so it helps if you are passionate about that niche. Don’t choose a niche based on the profitability of the niche. Choose a niche that you love or at least enjoy, or something that you want to learn more about. Obviously you don’t want to pick a super competitive niche. That being said, most any niche can be broken down further to a smaller niche AND most any niche can be successful through proper keyword research. As mentioned earlier, make sure your niche has products or services that are associated with that particular niche. Products can be digital, educational, or commercial by nature. You can read more about how to choose a niche reading this post: What is Your Niche? Once you’ve got your niche figured out, take the next step. Start searching for affiliate programs or products that you can associate with your niche. There are literally thousands of affiliate products, programs, and networks that you can work with. Some products have their own affiliate program, but most are set up through affiliate networks. In order to find affiliates for your niche, just take out a piece of paper and write down a few products that you can associate with your blog niche. Then, put the name of the product into a Google search, add a + sign, and then add the words: Affiliate Programs. Immediately, you’ll be able to find affiliate partners to work with. 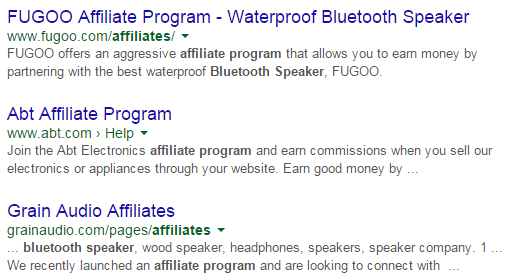 Below are the results of my search for affiliate programs for Bluetooth speakers. To understand more about affiliate marketing, feel free to check out this post, Internet Marketing and Affiliate Programs. Now that you’ve got your niche nailed down and potential affiliates for your blog, you need to come up with a website name. One that will help search engines like Google index your site. And something that is related to the keywords of your niche. For example, if your niche is selling professional baseball cards online, you would want to find a website name to be something like ProBaseballCards.com. You ideally want to buy a domain name that ends in .com. But .org or .net are fine as well. Also, try to avoid hyphenating the website name if you can. Also, think of your domain name as your brand. Every blogger needs to realize the you start branding your blog from day one. And that starts with a good domain name. Read to post if you need help selecting a good domain name. To buy your domain name, you can use companies like GoDaddy.com, but many bloggers and website owners feel that GoDaddy tries to up-sell them on too many other products. I use Wealthy Affiliate’s Domain Name Service because they don’t have all of the up-sells, they have a very good domain search as well (right on their homepage), and they tend to be very quick when updating your DNS settings (Domain Name System) with your hosting. Domain names should run you about $15 dollars per year or less. Website Hosting is where your website lives, it’s like the physical address of a home. You can get hosting from a number of services. SiteGround hosting is one of the hottest providers our there these days. Most basic hosting services cost around 5 dollars per month. You can always buy a yearly membership and pay around $35 – $40 dollars per year. WordPress is the most popular blog and website building content management system to date. It’s easy to use and offers great functionality. This is like the backend of a website, from where you control everything. 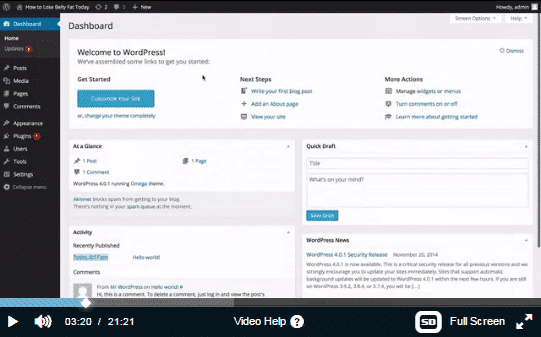 The process to install WordPress to your computer is..
For more details or questions on installing WordPress, you can get more information here. With my favorite blogging/online business training program, Wealthy Affiliate, they have a built in WordPress website creator. So it actually takes about 30 seconds to install your WordPress website, it’s as easy as 1, 2, 3. Since Wealthy Affiliate also hosts your blog, you can conveniently access your website directly from the Wealthy Affiliate homepage. You can also check out your blog’s health, get feedback on your blog and/or blog posts – which is pretty helpful when starting out. Here’s how my access page looks below. This is also very easy to do with a little help. 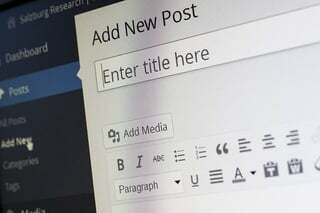 Before you start blogging, you will need to get familiar with using WordPress as well as install just a few plugins. Plugins provide functionality to a website. For example, social share buttons on blogs allow you to share content through your social networks – this is completed using a specific plugin. Or say you have products that you sell on your blog, you would use an eCommerce plugin to accept credit card payments. There are 1,000’s of plugins and you don’t need most of them to get started creating your blog. The plugins you will first need for your blog are to protect you from spam and maximize your search engine optimization. You want to keep the number of plugins between 5 – 10 so that you keep the speed of your blog at a maximal level. This will give your blog audience a better user experience – which is what it’s all about. No one likes a slow blog, right! Below I’ve placed a video to the Wealthy Affiliate classroom on setting up your blog/website. Click below to check it out. You can see step by step instructions on how to manage and understand WordPress as well as install your initial plugins needed to manage your blog. Now that you’ve got your blog set up, you will need to understand the importance of content. Content will make or break your ability to make money as a blogger. Remember, QUALITY CONTENT IS KING in the blogging business. Don’t want to write content. I didn’t either. I now outsource most of my content these days. One excellent source for finding original content as well as help boost the process of starting your website is an excellent service called Human Proof Designs (click the link to read our review of these guys). Content is mostly thought of as written content, but videos and info-graphics are other forms of content that can play a massive rolls in getting traffic to your blog as well as influence your website rankings. If you want to truly understand how to make money blogging for beginners, the first thing you will need to understand is..
How to write content based on keyword research that is related to your blog’s niche. Keywords, and really keyword phrases, are the basis of what your blog audience is searching for online and what you ideally want to provide them. If you can write quality content that helps your audience, and is based off of keyword research, then you will see your content rank under specific keywords and keyword phrases. You need to use low competition keyword phrases so that you will be able to rank faster and easier. Here’s how you find keywords as well as content ideas for your blog. Each one of these techniques are discussed in separate blog posts linked right above for more details. To simplify the process, let’s use another training video provided by Wealthy Affiliate so that you can see how keywords work. When people start searching how to make money blogging for beginners, the keyword here is money. Think more about writing for and helping your blog audience. Focus on building traffic to your site and growing your blog on a daily basis. Then as your site gains some clout with Google, Yahoo, and Bing, then you’ll focus on the money. The key to making money from your blog is going to be creating traffic, which is accomplished through content that gets ranked. Part of getting traffic and ranking your content, is to start to develop your social networks and/or become involved in chat forums that are based on your blog niche. For every blog you write, you want to be sharing it socially on all your social profiles, networks, and groups. You want to pick social networks that are relevant to your blog niche. Sites like Facebook, Instagram, Twitter, Google Plus, Pinterest, Linkedin, Triberr, etc. This is a big part of bringing traffic to your blog and as more visitors engage in your content through social media, you will see better rankings for your blog which will lead to even more traffic. Click here to get our guide to drive targeted traffic to your website or online products – It’s Totally Free! The key to making money by blogging is intention. Go into this with the intention of helping people based on something that you are passionate about. If you can help people that share a common niche with you, the money will come. 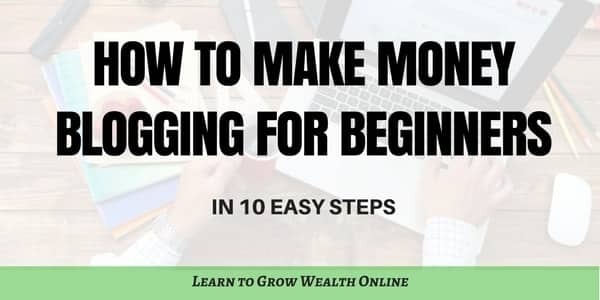 I hope this has been a helpful guide for you to learn how to make money blogging for beginners, if you have any questions, please leave me a comment below.